...in the michael and Mrs.5000 Book Arts (and Bookarts-Related) Collection. This first one is quite an extravagance for us, a one-of-a kind item. 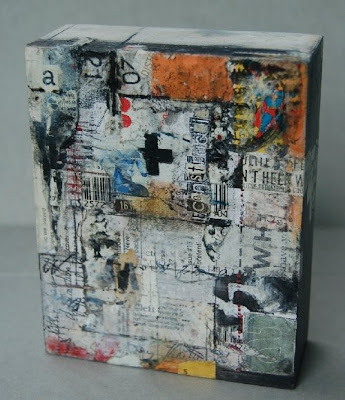 It is a small and intricate collage piece by Linda Welch, an artist from here in the City of Roses. We bought it at 23Sandy, the Eastside Gallery that specializes in book arts and bookish arts, as well as photography. Here's more of the work that Ms. Welch had up at her 23Sandy show earlier this year. 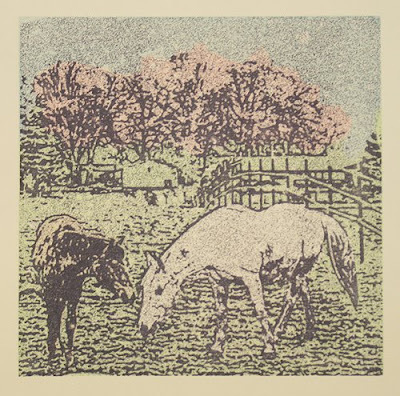 Also new in the collection is Mare and Foal, this print by Honorable Vice Dork Emeritus fingerstothebone, working under the name she uses in her artistic career, "Shu-ju Wang." Mare and Foal is a print, and I bet that if you asked her real nicely, fingers would sell you one. In fact, here is the venue from which she is selling them! Tell her michael5000 sent you, and you'll get double the usual number of Green Stamps. What Green Stamps? Did I give you some? What ARE Green Stamps anyhow? Green Stamps were... wow... a really weird fixture of American life until about 1980, when they disappeared. You would get them at the grocery stores, paste them into books, and redeem them for mediocre merchandise. I spent many mildly happy hours as a little boy filling the Green Stamps books. Hmmm. Green Stamps are people! They're people!!! my dad had a pack of green stamp books when we lived in a very small town. nice arts, btw! I love that collage piece . . . wow. The Great Movies: "The Wild Bunch"
The Great Movies: "The Third Man"
The Great Movies: "A Woman Under the Influence"
The Reading List: "Don Quixote"
The Great Movies: "Written on the Wind"